You are here: Home / Blog Post / School benefit auction catalog need some bling? Try a ring. 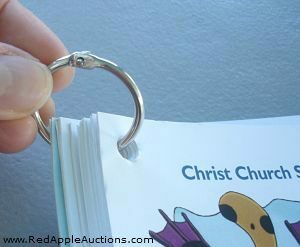 Here’s a change for your charity auction catalog: Forego the traditional binding and opt for a ring. One of my client’s – a school benefit auction committee – tried an experiment with its catalog. Instead of opting for the common binding, which is often staples or a plastic spiral binder, the committee decided to use a ring. The thinking was that the catalog would be easier to carry. A guest could loop the ring around his finger and still hold a beverage of choice while milling through the reception. The idea sounded good in theory but didn’t work well in practice. “We didn’t like it,” one committee member said. On the downside, the pages were more difficult to manage. Flipping through the catalog to find an item or section wasn’t easy. And overall, the group just didn’t like the look and style. If you’d like to try the idea, the concept works best on smaller auction catalogs. When you have fewer pages, using a a small ring is a novelty and “performance” (i.e. the ability to flip through the pages) isn’t as critical. Nonprofit auctions tend to have smaller catalogs. But for a standard school benefit auction catalog that numbers 20+ pages, the ring becomes unwieldy. Test it out before you use it. Print out your catalog and latch it with a ring before deciding. t’s an interesting look but you might decide you prefer the old standby: binding.